If you’re ready for your next leadership move, then consider joining IABC/BC’s executive team and bringing your strategic mindset to the chapter that will host the globe at the World Conference in 2019! The Board of Directors is now accepting nominations for the role of Vice President for 2019–2020. You’re an enthusiastic leader and IABC brand ambassador, and excited to move our chapter forward. You’re keen to lead a dedicated group of chapter leaders, who are committed to our community of communications professionals. If you are a member who is ready to step into this leadership position and gain invaluable entrepreneurial skills and business experience, this is the role for you. IABC/BC is a vibrant community of professionals working in communication and marketing related disciplines driving business results through strategic communication. We support each other – across industries and regions – through sharing knowledge, leading on best practices, formal and informal mentoring, certification and awards. What does the VP role involve? Help shape the future of your chapter– and. contribute to our goal of becoming international chapter of the year! All IABC/BC members in good standing (i.e. 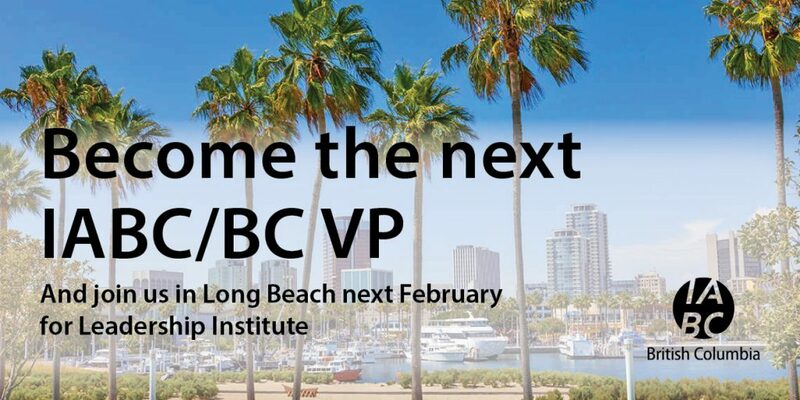 are professional members whose dues are up-to-date and have not contravened IABC’s Code of Conduct) are welcome to apply for the position, which starts July 1, 2019 (note the first event the Vice President would attend is IABC’s Leadership Institute from February 7-9, 2019 in Long Beach, California). If this sounds like a fit for your next leadership move, please review the additional details below and complete the VP nomination form. The form will ask you to either submit a resume or provide a link to your Linkedin profile. If this does not describe you, we still believe in you. Apply anyway! Don’t hesitate to reach out to current VP Adam Brayford to learn more about the opportunity. You’ll reach him at vicepresident@iabc.bc.ca.